WORLD APPEARS MORE BEAUTIFUL TO CURIOUS MINDS. I am currently a postdoctoral fellow with Dr. Iulian Iordachita at Laboratory for Computational Sensing and Robotics, Johns Hopkins University. I received the PhD degree in Robotics Engineering from Worcester Polytechnic Institute in 2017, Dr. Gregory Fischer was my Ph.D advisor. I received my Bachelors degree in Computer Engineering in 2005 from North Gujarat University, India and M.Tech. 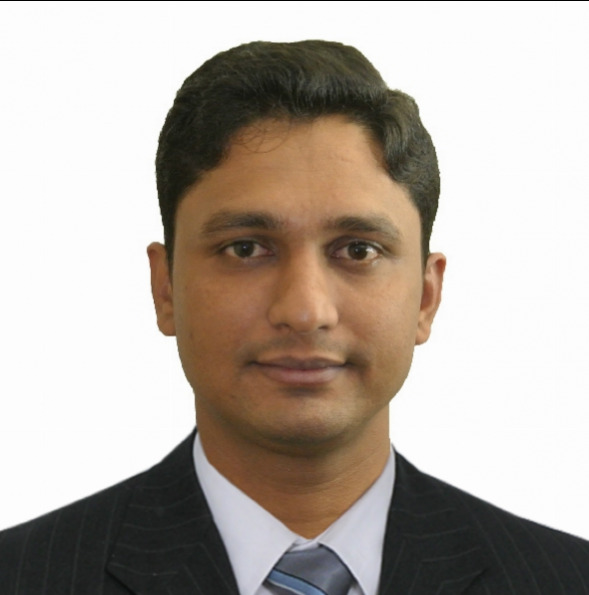 degree in Computer Science and Engineering in 2007 from Nirma University, India. My current research interests include medical robotics, image guided interventions, robot assisted retinal surgeries and path planning. Involved in development of MRI guided robotic system for shoulder arthrography and safe manipulation for robot assisted retinal surgeries. 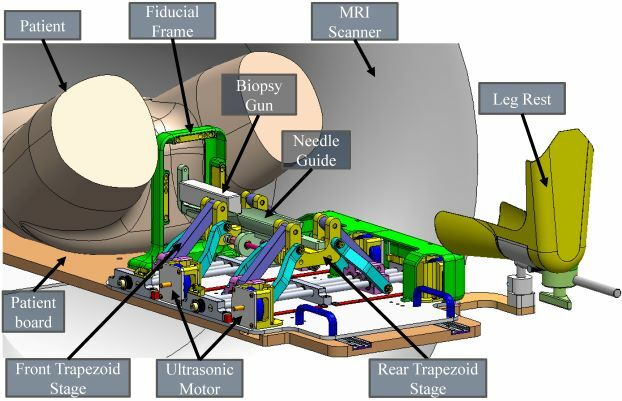 Developed MRI guided robotic systems for needle steering, prostate biopsy and stereotactic neurosurgery for tumor ablation. The prostate biopsy system has been used for 30 patient trials at Brigham and Womens' Hospital, Boston, USA, while the neurosurgery system has been evaluated in animal model. Mentoring three graduate students in AMIRO research lab. Guiding them towards their research goals and providing them technical and intellectual help. Delivered following courses at undergraduate level: embedded systems, digital electronic, design of operating systems and computer graphics. Designed and conducted laboratory sessions for the following courses at undergraduate level: digital electronic and design of operating systems. Software Engineer, ABB - Corporate Research Center, Bangalore, India. Software Engineer, Hewlett Packard, Bangalore, India. Developed a JAVA/J2EE module which enables HP customers to purchase Printer consumables online and helps HP to maintain their product information. Received Gold Medal for the Best Student Award of M.Tech 2007 batch from Nirma University of Science and Technology. Won First prize for presenting project on C++ Robot at Convergence-2003 at U V Patel College of Engineering, India. Won First prize for presenting project on C++ Robot at Technigma-2003 at Sankalchand Patel College of Engineering, India. 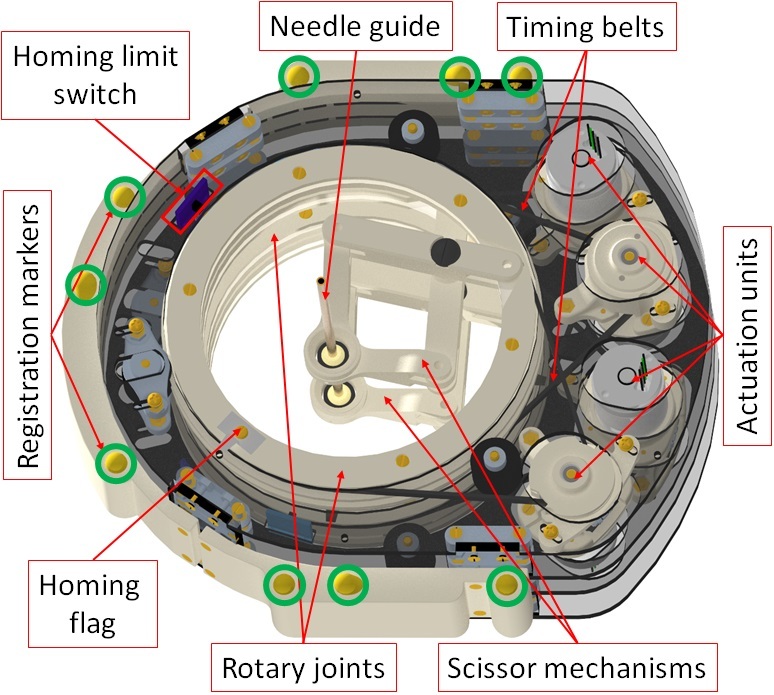 This project aims at development of a robotic system for targeted transperineal prostate biopsy under direct interventional magnetic resonance imaging (MRI) guidance. The clinically integrated robotic system is developed based on a modular design approach, comprised of surgical navigation application, robot control software, MRI robot controller hardware, and robotic needle placement manipulator. The system provides enabling technologies for MRI-guided procedures. It can be easily transported and setup for supporting the clinical workflow of interventional procedures, and the system is readily extensible and reconfigurable to other clinical applications. System has been evaluated in phantom studies as well as 30 patient trials at Brigham and Women's Hospital. Worcester Polytechninc Institute Johns Hopkins University BWH and Harvard Medical School Acoustic Medsystems, Inc. The aim of this project is to develop and integrated robotic system to precisely ablate deep brain tumors under real-time MRI guidance using needle-based therapeutic ultrasound (NBTU). This system is clinically optimized to perform and monitor an in-bore ablation procedure. The integrated system comprises of an updated robotics manipulator, the NBTU ablation system, surgical planning and navigation applications and custom developed application for real-time thermal dosage monitoring.This system has been evaluated in phantom and in 10 porcine trials demonstrating targeting and realtime monitoring of the ablation region via magnetic resonance thermal imaging (MRTI). Worcester Polytechninc Institute UMass Medical School Albany Medical Center Acoustic Medsystems, Inc. This project aims at development of a body mounted robotic system for MRI-guided shoulder arthrography in pediatric patients. 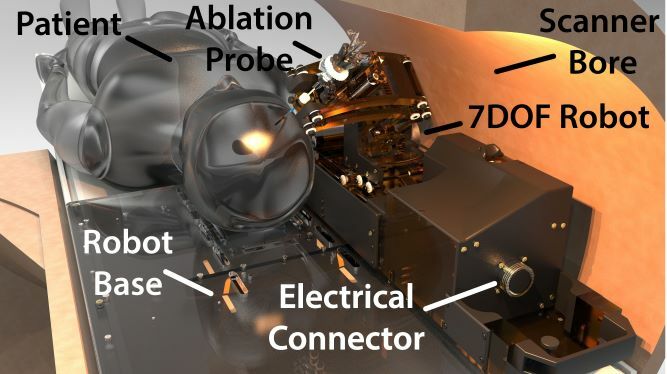 The robotic manipulator is optimized for being accurate yet light enough to perform the contrast agent injection and joint examination imaging inside the MRI bore. It provides 4 degrees of freedom (DOF) to align the needle guide to an accurate insertion trajectory. In shoulder arthrography procedures, contrast agent is injected under fluoroscope guidance resulting in radiation exposure which should be avoided for pediatric patients. Also after contrast agent injection typically MRI images are acquired for examination resulting in two stage procedure. This system allows clinicians to perform both contrast agent injection and joint examination under MRI guidance, hence completely eliminating radiation exposure from fluoroscope guidance and patient movement from X-Ray/CT room to MRI suite. Retinal surgeries require extremely delicate manipulation skills. One of the major challenges in robotic vitreoretinal surgery is measuring and controlling the tool forces applied to the sclera. Tissue safety, coordinated smooth tool motion and interactions between tool tip and retina are not yet widely explored. Surgeon's ability to perceive scleral forces is further diminished by the stiff robotic system. Microsurgical tools capable of measuring such small forces integrated with robot-manipulators may therefore improve functionality and safety by providing sclera force feedback to the surgeon. This projects aims at development of enabling technologies to measure these tool-tissue interaction forces and employ them for development of control strategies. Using a force-sensing tool, we have conducted robot-assisted eye manipulation experiments to evaluate the efficacy of providing scleral force feedback. We have assessed efficacy of passive audio feedback and active haptic feedback. 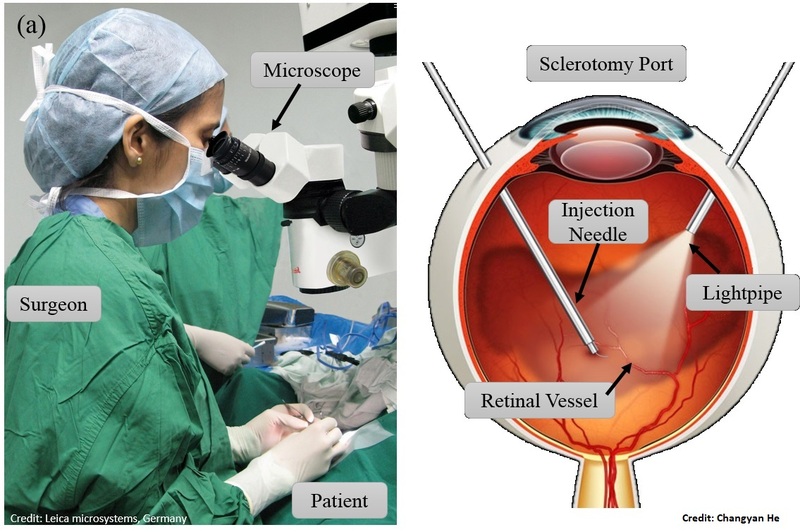 Retinal microsurgery requires highly dexterous and precise maneuvering of instruments inserted into the eyeball through the sclerotomy port. During such procedures the sclera can potentially be injured from extreme tool-to-sclera contact force caused by surgeon's unintentional mis-operations. This project aims at development of an active interventional robotic system to prevent such iatrogenic accidents by enabling the robotic system to actively counteract the surgeon's possible unsafe operations in advance of their occurrence. 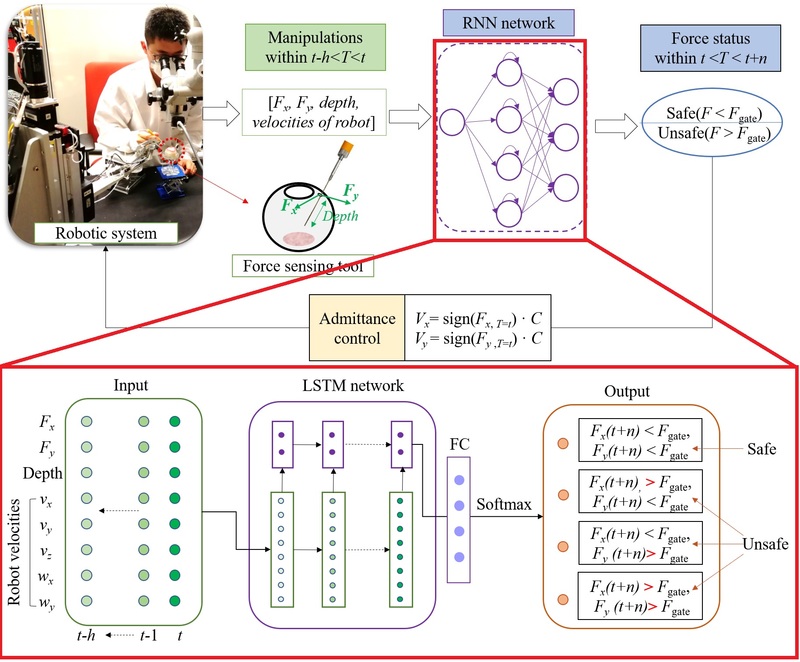 Relying on a novel force sensing tool to measure and collect scleral forces, a recurrent neural network with long short term memory unit is trained to oversee surgeon's operation and predict possible unsafe scleral forces up to the next 200 milliseconds; then a linear admittance control strategy is implemented to actuate the robot to reduce the undesired scleral force. The system is implemented using an existing "steady hand" eye robot platform. This machine learning technique is evaluated on an artificial eye phantom by performing a "vessel following" mock retinal surgery operation. Empirical validation over multiple trials indicate that the proposed active interventional robotic system could help to reduce the number of unsafe manipulation events. This project aims at development of a body mounted robotic system for MRI-guided pain injections in lower back.